Low-lying coral reef islands are typically less than three metres above sea level, making them highly vulnerable to rising sea levels associated with climate change. However, research has found new evidence that the Maldives – the world's lowest country – formed when sea levels were higher than they are today. 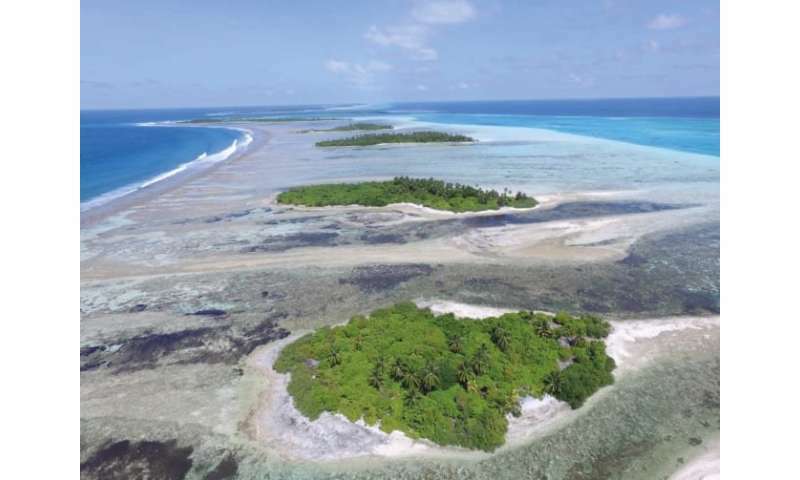 The researchers say that under climate change, projected increases in sea level and the magnitude of large wave events could actually lead to the growth of reef islands, but only if the coral reef remains healthy to provide the building material. The research was led by Dr. Holly East of the Department of Geography and Environmental Sciences at Northumbria University, Newcastle. She explained: "Coral reef islands are typically believed to be highly vulnerable to rising sea levels. This is a major concern for coral reef island nations, in which reef islands provide the only habitable land. "However, we have found evidence that the Maldivian rim reef islands actually formed under higher sea levels than we have at present. This gives us some optimism that if climate change causes rising sea levels and increases in the magnitude of high-energy wave events in the region, it may actually create the perfect conditions to reactivate the processes that built the reef islands in the first place, rather than drowning them." However, Dr. East stressed that this could only occur if healthy live coral was available in the region's reef communities. "As these islands are mostly made from coral, a healthy coral reef is vital to provide the materials for island building," she said. "However, this could be problematic as corals face a range of threats under climate change, including increasing sea surface temperatures and ocean acidity. If the reef is unhealthy, we could end up with the perfect building conditions but not the bricks." Dr. East worked with academics from the University of Exeter (UK); Simon Fraser University (Canada); University of Auckland (New Zealand); Southern Institute of Technology (New Zealand) and the UK's Natural Environment Research Council (NERC) on this study. Dr. East added: "It is also important to note that the large wave events required for reef island building may devastate island infrastructure, potentially compromising the habitability of reef islands in their current form. A challenge for reef island nations may therefore be to develop infrastructure with the capacity to withstand, or be adaptable to, large wave events." Their paper, "Coral Reef Island Initiation and Development Under Higher Than Present Sea Levels," is now available in Geophysical Research Letters. Finally, a balanced article that doesn't just demonize AGW. Sorry, Bart_A, not really "balanced". They're just admitting a fact (coral reef islands tend to grow) but obfuscating it with unproven caveats (ocean "acidification" and warming are killing coral). Rapid warming does indeed kill coral, for example during strong El Niño events. So does rapid reduction in seawater pH as done in laboratory tests (which is entirely unrelated to what's going on in the oceans). However the long-term rate of warming and reduction of ocean pH is so slow and small that coral, like all living organisms, is likely to adapt. Coral has been around for 450 million years and has survived huge temperature and pH swings. I'm betting coral will be around for awhile. Interesting article - one more piece in the big jigsaw puzzle of science. Be nice if the comments section could reflect the kind of thoughtfulness of the many articles we see related to climate change - but trolls will be trolls - and science and facts of course mean nothing to them.